Less than 20 percent of the entries about historical figures on Wikipedia are about women. That may be because nearly 90 percent of the editors on the site are men, said Kristen A. Treglia, a senior instructional technologist for faculty at Fordham IT. 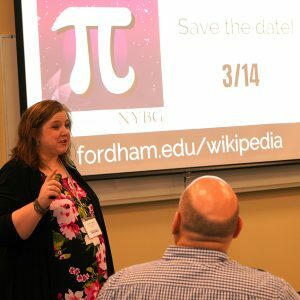 Kristen Treglia said students will have another chance to increase women’s representation on Wikipedia on PiDay, March 14, at Rose Hill. Treglia made these remarks to volunteers gathered at an edit-a-thon focused on women’s history at Fordham’s Lincoln Center campus on March 7. According to Wikipedia, an edit-a-thon is an organized event where people edit and improve a specific topic or type of content. It typically includes basic editing training for new editors. The Fordham edit-a-thon event was hosted by Wikipedia for Educators at Fordham. The training component was essential, as few of the event’s attendees had a Wikipedia account, though most said they use the site. And most had never edited an entry before. 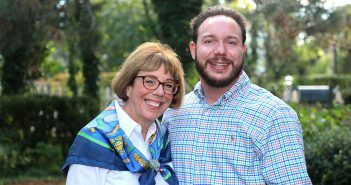 “Almost every woman I talk to will say, ‘Who am I to edit Wiki?’ and yet men think ‘This is great,’ and just do it,” said Treglia, who said that she derived her tech know-how from the support she got from women along the way. “I was lucky to have female teachers, female role models who said I could do it, and told me that I have an expertise and I should share it,” she said. And share it she has. 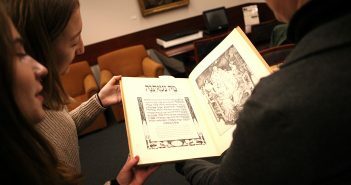 Treglia has run several edit-a-thons at the University, including one where she partnered with Fordham Libraries to bolster Fordham’s own entry to coincide with the University’s dodransbicentennial. All of the events are meant to encourage students and faculty to share their research and knowledge, particularly faculty who often frown on the site as a somewhat dubious citation resource for students. She noted that assigning contributions to students would also bring more women into the Wikipedia community. “If students and young people don’t see women on the site, it may not even occur to them that they’re missing,” she said. Of the nearly two dozen participants, several created new accounts. Another continued to supplement an existing article that she recently introduced about Dorothy Creol, one of the first black women to arrive in New York in 1627. Another made an edit to a page devoted to Lucretia Mott, the 19th-century Quaker abolitionist and women’s rights activist. Meanwhile, a Rose Hill technologist joined the group virtually by adding to an article on feminist geography, which uses feminist theories to study geographic space. Several community groups that focus on raising the visibility of women in history participated in the event, including Monumental Women, the nonprofit dedicated to placing the first statue celebrating women’s history in Central Park. It honors Elizabeth Cady Stanton and Susan B. Anthony. The group is also responsible for a Women’s History Trail that currently encompasses Manhattan, but not yet the outer boroughs. Board President Brenda Berkman said the group is working on fixing that. She noted that the afternoon’s online efforts reflect a need to combat discrepancies in the real world, such as the lack of information on Lucy Burns, the second wave feminist and social justice Catholic. Outside of her gravestone at Holy Cross Cemetery in Brooklyn, there isn’t any other historic marker. Incidentally, Berkman does have a Wiki page dedicated to her. She was the first woman firefighter hired by the New York Fire Department after she sued the department for discrimination. She was also a first respondent at the World Trade Center on September 11th and retired in 2006 as captain. Treglia said that a dentist who attended Wednesday’s event found the women in dentistry category lacking, as are entries for women in STEM fields generally. It’s something Treglia hopes to tackle in the group’s next edit-a-thon on March 14, also known as PiDay, for its 3/14 marker. That event will focus on shoring up pages on women scientists. So far, Guy Robinson, Ph.D., a lecturer in biology, has assigned his class to attend the event. Once again, community participants will be on hand, as will volunteers from Wikimedia NYC, which seeks to support free educational content online. “Here’s an opportunity for more women to become editors and increase the amount of information on women in the sciences,” said Treglia. The PiDay event will take place in the O’Hare special collections room at Walsh Library from 4 to 8 p.m., and, of course, pie will be served.